VOICE OF HAM RADIO: News & views of interest to amateur radio operators and gadget geeks. (DALLAS-FT. WORTH, TX) For the 10th consecutive year, The 3916 Nets will be staging The Santa Net on 3.916 MHz. 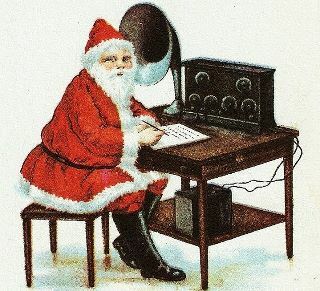 Good girls and boys will be able to talk to Santa Claus, via amateur radio, nightly at 7:30 PM (Central) starting November 26, 2015. The Santa Net will run nightly through Christmas Eve, December 24, 2015. Pete Thomson (KE5GGY), of The 3916 Nets, commented on The 3916 Santa Net. He said, "Christmastime is our favorite time of the year on 3.916 MHz. We really enjoy being able to help young people experience both the magic of Christmas and the magic of amateur radio." Youngsters can talk to "Santa at The North Pole" via strategically placed relay stations who are responsible for relaying in the voice of Santa. Thomson said that The Santa Net is a team effort that involves the efforts of a number of 3916 Net members. He said, "In our 9 years of doing The Santa Net, we've connected kids from coast to coast with Santa Claus. With this amount of territory to cover, The Santa Net requires the efforts of a number or relay stations. Our relay stations do a super job and really enjoy bringing the spirit of Christmas to the amateur radio airwaves." Prenet check-ins are welcome each night starting at 7:15 PM central or via email at 3916nets@gmail.com Third party rules and regulations apply. The Santa Nets are presented annually by The 3916 Nets. The Weather Bunch, The Rag Chew Crew, The Tailgaters, The Freewheelers and The 3916 Late Late Show are all amateur radio nets that meet on 3.916 MHz. For more information on The 3916 Nets, go to http://www.3916nets.com The Facebook page for The Santa Nets can be found at https://www.facebook.com/3916santanet/ For more information on The Santa Net, email KE5GGY at Gmail dot com. Husband, father, ham radio operator & out-of-control gadget geek.